The past couple of weeks have been a case of ‘good news and bad news’ for customers of the F-35 Joint Strike Fighter. 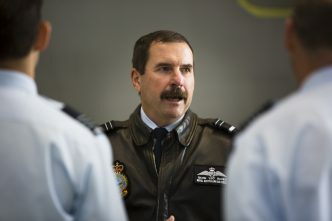 As a country about to commit to the bulk of its currently approved 72 aircraft purchase, it’s to be hoped that our defence procurement people have been watching recent developments closely. 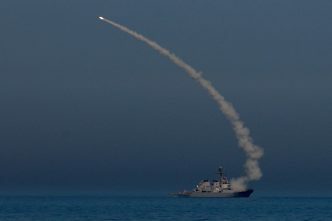 We’re now looking at a longer wait and a higher price for some of the key capabilities we’re after—especially a dedicated maritime strike capability. But let’s start with some good news. The USAF budget request for the 2019 financial year was released recently and, as was the case in the past few years, the forward prices reflect an increasingly mature production effort. 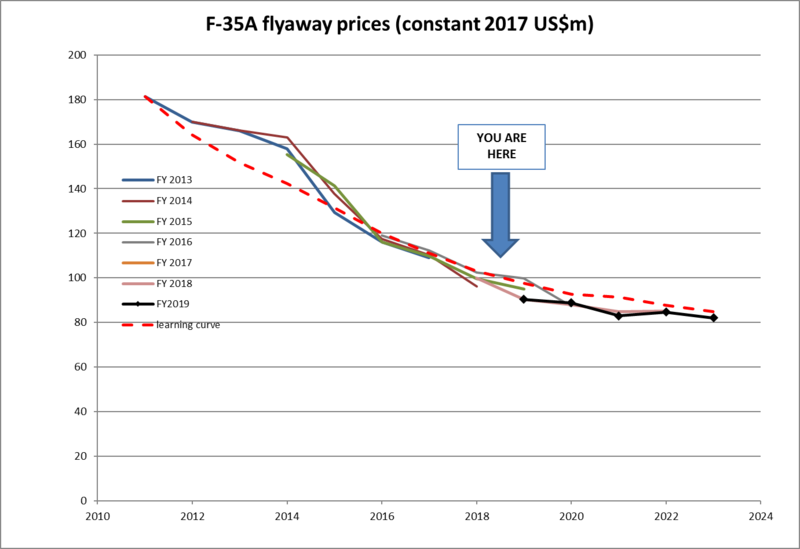 The figure below, drawing on budget requests since 2013, shows the ‘flyaway price’ of the air force variant that Australia is buying. As usual, I’ve included a calculated ‘learning curve’ of prices that represents the industry standard. This year’s figures are shown in black and the predicted prices are flattening out as expected. There are only very slight year-on-year changes over 2017, 2018 and 2019. So far so good. The bad news is in two parts. First, those numbers are just budget placeholders, and don’t yet represent contracted figures. It’s not unusual for there to be a certain amount of argy-bargy between the government and contractors during price negotiations, but the public discourse between the Pentagon and Lockheed Martin is getting a little heated. We’re now five months past the Pentagon’s preferred October 2017 contract signature date. If all else fails, the Pentagon can take unilateral action to finalise the deal, as it did in 2016. But it would be better for both parties to agree on the price and terms. 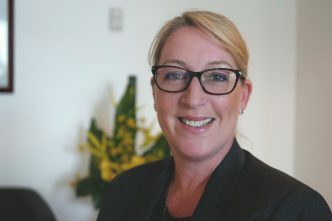 The contract details matter to Australia. Despite having been partners in the program since 2002, the amount we end up paying will still reflect the production costs in the US-based program—there are no fixed price deals here. The second lot of bad news concerns the jet’s capabilities. The figures above refer to aircraft at ‘Block 3’ standard. Many of the capabilities we really want—especially a dedicated anti-ship weapon—won’t be delivered until later capability blocks. We’re now starting to get some public indications of the costs of those future capability increments, and they aren’t especially reassuring. 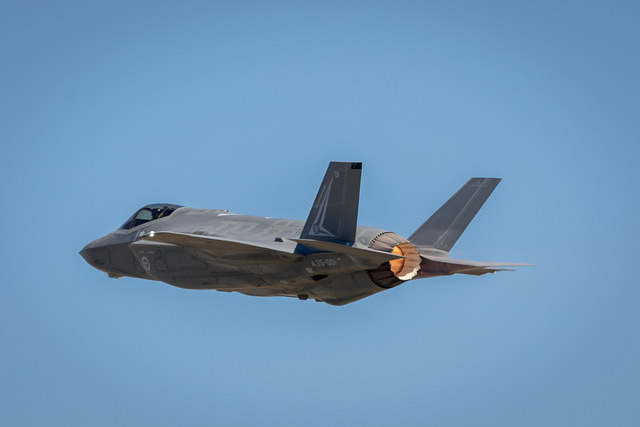 The F-35 ‘modernisation program’, in truth, actually includes many of the capabilities that customers originally thought would be in earlier deliveries but have since been pushed out in order to streamline the already-delayed development program. The upgrades now might carry a price tag of US$16 billion, considerably more than previous estimates. The international partners in the program will potentially be required to pay US$3.7 billion of those additional costs. The bulk of the upgrades—though not all—will be implemented through software, rather than through physical modifications to the aircraft or its subsystems. That’s only partially reassuring though—the aircraft’s processors probably need replacing to run later software loads, and software development and testing are also frequent sources of delays. And not everything can be done with code. My reading is that a decision is needed in the next couple of years as to whether to include the required hardware modifications on the production line, or to retrofit them later. There are pros and cons to either approach. Changing the hardware fit on the production line now, just as the benefits of the learning curve are kicking in, risks slowing the production rate and bumping back up the learning curve until the changes are completely assimilated. But retrofitting later necessarily takes aircraft offline for a while and is generally more time consuming (read: expensive) than building changes in from the start. And it’s unclear how any such decisions would impact the move towards a multi-year ‘block buy’. So it seems that Australia faces additional costs—or a longer wait—for capabilities we previously identified as ‘must haves’. Block 3 aircraft will be very capable and would certainly be a step up in capability from the Hornets and Super Hornets we’ve sent to Iraq in recent years. But those missions don’t reflect our regional strategic circumstances, which really require advanced maritime strike capabilities. The F-35 program continues to offer a mix of promised advanced capability and disappointment. While there’s no real alternative for the 2020s (and probably for some time beyond), we’re still going to be flying Super Hornets until the Block 4 or 5 F-35s mature. And potential adversaries are working on closing the gap, so the F-35s’ slow development means that users will get less utility from the purchase than would have been the case had the jets been delivered close to the original schedule. 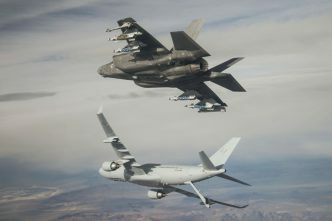 In that context, I think it’s worth reiterating something that Malcolm Davis and I wrote a couple of years ago: the RAAF shouldn’t rush to buy more F-35s early in the 2020s. Time’s moving on, and there might be smarter options coming along. Andrew Davies is the outgoing director of the defence and strategy program at ASPI. Image courtesy of Flickr user Ant Le Breton.